On April 5, 2019, the chilling Stephen King story, Pet Sematary (novel 1983) is ready once again for widespread release on the big screen as a reboot of the 1989 movie version. A cautionary tale along the lines of The Monkey’s Paw, The Box, and any such “be careful what you wish for” type of stories, Pet Sematary teaches us that dead things are better left dead. The gist of the story is that Louis Creed, a medical doctor, and his family, consisting of a wife (Rachel), a toddler (Gage) and a Kindergarten age daughter (Ellie) move from Chicago to a rural Maine town for Louis to start over as the campus physician for the University of Maine. On the newly acquired Creed property is a pet cemetery used by the entire town’s contingent of children for many generations as the local burying ground for their pets. The main cemetery is marked by a childishly constructed sign announcing “Pet Sematary.” Numerous crudely fashioned memorial markers made of scrap wood and metal and flat stones mark the graves of the late pets. A “blowdown” of fallen trees and branches forms one side of the cemetery, appearing unlikely to have been formed naturally without the collusion of people. Beyond that blowdown is even scrubbier ground considered by the Native Americans that previously lived in the area as a sort of cursed ground. The entire area is creepy and of questionable safety, but the elderly neighbor, Jud (played by Fred Gwynne in the 1989 film and every bit as well by Jon Lithgow in the current version) calms the Creed parents with the admonition that kids are safe here as long as they do not stray from the path that leads to the cemetery. He also advised Ellie not to climb on the blowdown, as doing so is dangerous. Beyond the blowdown is another pet cemetery that has supernatural properties, as related by Jud to Dr. Louis when the Creed family cat is killed by a speeding truck. Bury something in that eerie place and it comes back to life, though not quite as it was before. In fact, quite creepy and dangerous, as we and the Creeds find out! The obvious and inevitable course of events is that someone would try to bury a dead person in the supernatural ground in order to bring that person back, with strongly implied horrific consequences. The original movie was fairly true to the novel, and so is the reboot. We hate to provide spoilers that could ruin your viewing pleasure, so we will not diagram every difference between the 2 films and the book, with minor exceptions. Little differences such as Ellie being stung by a bee instead of Gage and the horribly injured Victor Pascow is played by an African American actor in the new film. Jud’s wife is deceased in this film version, while she is still alive in the novel. Who is going to die? Who is going to survive? What will the final outcome be? (Those familiar with the novel and first film may be moderately surprised.) Though the novel has a truly King-esque creepy ending, the new movie gives the ending a new wrinkle. 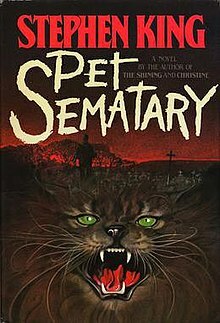 While the original, 1989, film had a sequel (the not as successful Pet Sematary Two) this current, 2019, reboot may have a prequel in the offing. The original movie had good actors with good acting and directing, as does the 2019 version, but the 2019 version has superior special effects. While it is hard to beat an original when it comes to jump scares and the novelty of the story, enough time has passed that many audience members may not be familiar with the story or the previous film leaving plenty of room for new experiences. That being said, audience reaction that strikes this reviewer as rather odd at the pre-screening we attended was that those in the audience that expressed disdain for the movie were younger people, mainly teenagers. Most audience members were quite satisfied with the film, a worthy reboot and highly entertaining with some graphic gore and high tension scenes. The movie never got silly with unnecessary attempts at humor to distract us, either. There was a certain amount of out of place laughter among the gasps during startling horror scenes, but of course, the implication was that the laughing people were enjoying the movie. Like we said, the majority of the movie audience had a positive reaction to the film, and we think you will, too. The 1989 film starred Dale Midkiff as Dr. Louis Creed, and the new movie has Jason Clarke in the same role. At first Clarke seemed a bit pedestrian to play a physician, but as the movie progressed it became apparent Clarke was the perfect choice for the role. Lithgow puts on an excellent portrayal as the kindly, elderly neighbor Jud Cranston previously played by Fred Gwynne (Gwynne may have the better Maine accent, you tell us), but the real scene stealer was the performance by Laurence Jeté as Ellie Creed. Child actors often leave us distracted and disappointed, but Jeté plays her role to perfection. We expect a fine career ahead for this girl. A nifty casting move was to have a pair of twins alternately play the role of Gage, Hugo and Lucas Lavoie getting to split screen time as the little boy. 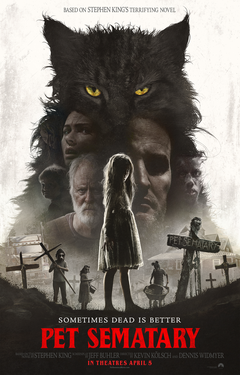 Make no mistake, we are fans of Stephen King stories and the movies made from those stories have been consistently excellent entertainment, including the remakes of Carrie, and this remake of Pet Sematary is no exception. We were thoroughly entertained by the film and confidently recommend it to Stephen King’s many fans. With a modest budget of only $21 million, we are confident the film will also be a financial success. Rated “R” for violence and death related themes, sensitive youngsters may be best left at home. Pre-teens with solid understanding of death and the difference between fantasy and reality could watch the movie at parental discretion. Questions for Students (and others): Have you read the novel? Have you seen the original movie? What is your favorite Stephen King movie? Please let us know in the comments section below this article. King at the New York Comic Con in February 2007. Photograph by Pinguino Kolb. Gore, Killian. Pet Sematary Unauthorized Quiz Book. Independently published, 2018. King, Stephen. Pet Sematary. Scribner; Reissue edition, 2018. 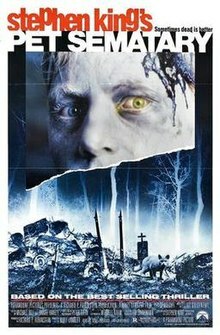 The featured image in this article is a poster for Pet Sematary. It is believed that the use of scaled-down, low-resolution images of posters to provide critical commentary on the film, event, etc. in question or of the poster itself, not solely for illustration qualifies as fair use under the copyright law of the United States.